Sat Apr 27, 2019 7:30 PM4th Saturday Contra: NO DANCE: Go to Norse Hall Sunday! 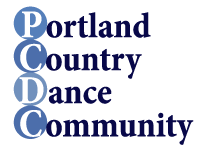 There a two-month dance schedule in the current issue of the PCDC newsletter, Footnotes, or check-out our comprehensive month-at-a-glance calendar which can view past and future dates. Please be aware of PCDC’s Safe Dancing Policy. From the North of the I5 (Marquam) Bridge: head South on I-5. Take exit 299A to merge onto OR 43/ SW Hood the Barbur Blvd. Turn right onto SW Lane St. Turn left at 1st cross street onto SW Kelly Ave. Turn right onto SW Bancroft St and look for the school on the left. From the South: head North on I-5. Take the exit 298 turn left onto SW Corbett Ave. Turn left onto SW Bancroft St and look for the school on the right. GPS users: many GPS and map systems ignore a leading 0. If yours does, specify “SW Corbett Ave & SW Bancroft St, Portland OR.” When you get there, go down the hill and the school is on the right. No street shoes permitted beyond the entrance. From the North: head South on I-5. Take the Barbur Blvd. exit, Number 296A, and turn left onto Barbur. Travel 0.7 of a mile past Fred Meyer. Turn left onto SW Spring Garden Street. Travel 0.3 of a mile and turn right onto 17th Avenue. Look for the dance hall on the left near the top of the hill. From the South: head North on I-5. Take the Taylors Ferry exit, number 295, and keep left at the fork in the ramp and merge onto Taylors Ferry. Travel 0.8 of a mile and turn left on 17th Avenue. Look for the dance hall on the right near the top of the hill.